In the recent days, we've seen so many images and rumors about the LG's upcoming isai FL which was said to be launched in Japanese market only. 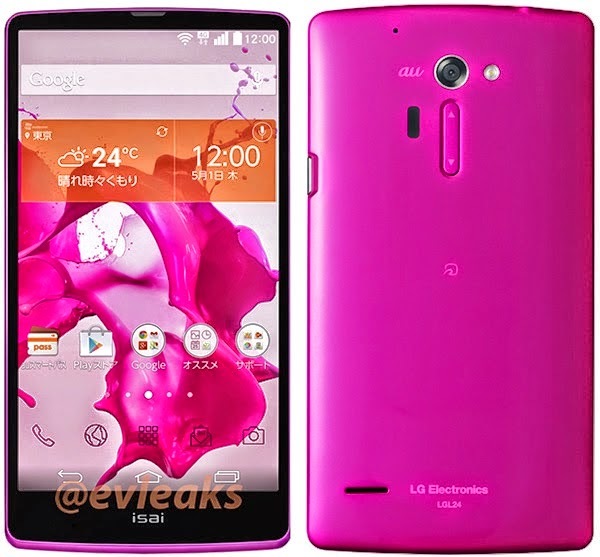 Though with the emergence of this device,it is believed that LG G3 will be based on this device. There were some images with the rumored news in which the phone was shown in blue and white color. Just like the past leaks, it's again evleaks who has leaked out the phone to be launched in pink color exclusively in Japanese market. The device includes the Qualcomm SnapDragon 801 SoC 2.5Ghz quad core chip, 5.5 inch LCD with a picture resolution of 2560x1440 with 2GB of ram and 32GB internal storage with a support of MicroSD card slot. To give this device all the juice, a 3000mAh battery is preloaded in the device with IPX7 rating which is a complete sign of the presence of water resistance technology. The device will run on Android KitKat 4.4.